Bought this at auction today! Runs well! Beastly fan... missing chain but switch is there! Emersons pedestals aRe very cool!! Good find George!!! Don't see too many of the four Bladers! Stan Adams wrote: Good find George!!! Don't see too many of the four Bladers! I am not familiar with these fans... are they normally 3 wingers? Rocky I think the earlier ones were 3, then 4 blade, then elephant ear 3 blade. My ceiling hung is 4'wing. Quiet as can be, but when I bought it the bearings were stuck. Tore them down & cleaned them, then repacked them with grease. The rear bearing was a "little rough", but hey new grease & low RPM, it will be fine. Bad idea!!! Sounds fine in the garage, go upstairs & it sounds like a chain saw! Hey George. 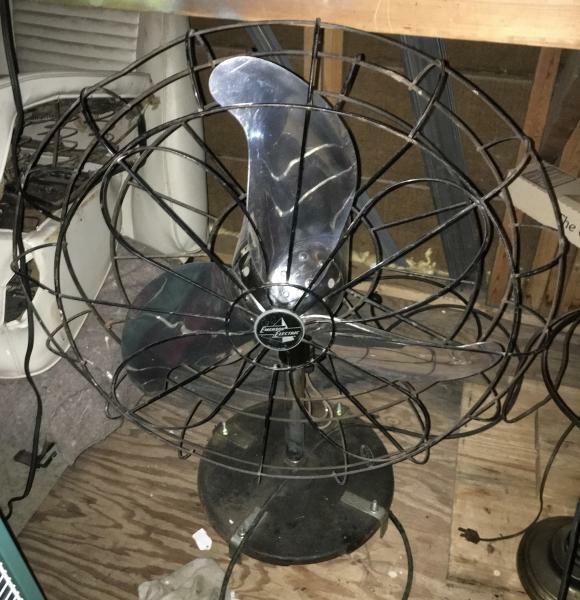 What was the brass blade fan they had at that auction? I emailed the auctioneer and he said he couldn't tell. Did you nab it too? I wasn't going that far not knowing for sure what it was. George nice find ,I'm sure Mike will be wanting that one, if not him I might be interested ,you can't have too many big Emersons!! Dang Lawrence, do you get frequent flyer discounts from the electric company? The 4 wingers were short lived from 1938-1939 and seem to have been made concurrently with the thin leaf blades. By 1940 they were elephant ear style. Nice fan, I have a Wagner in my shop that is the same model. I like the 4 blade ones, seem to be the quietest IMO. Here is mine Rocky. Quiet as can be running downstairs. Some day I'll change that bearing. Stan, one of these meets, we just tear the darn thing down and replace that bearing. I've been hearing about it for about 8 years now! Jay Bernard wrote: Stan, one of these meets, we just tear the darn thing down and replace that bearing. I've been hearing about it for about 8 years now! Steve Butler wrote: Hey George. 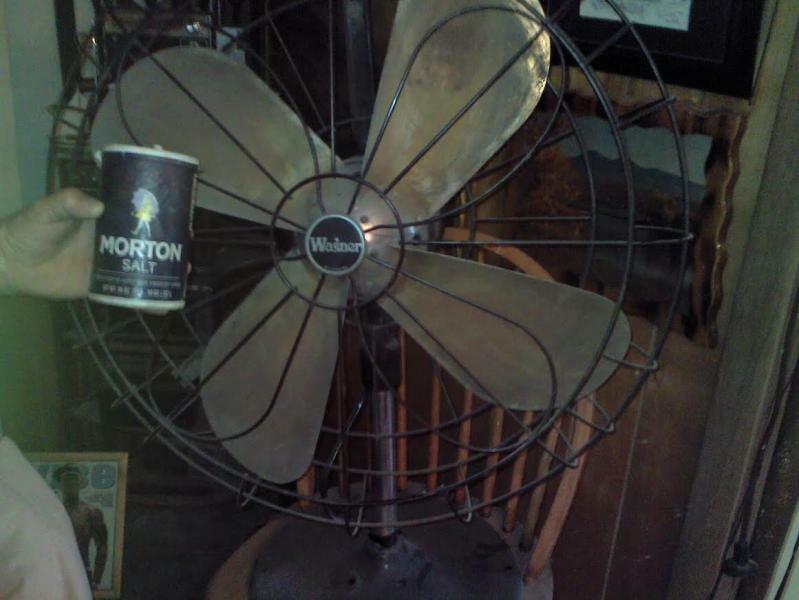 What was the brass blade fan they had at that auction? I emailed the auctioneer and he said he couldn't tell. Did you nab it too? I wasn't going that far not knowing for sure what it was. Andrew Block wrote: The 4 wingers were short lived from 1938-1939 and seem to have been made concurrently with the thin leaf blades. By 1940 they were elephant ear style. 1937- 4 wingers offered single speed only floor-wall-ceiling. 1938- 4 wingers offered single speed only floor-wall-ceiling. 1939- 4 wingers offered single speed only floor-wall-ceiling. Interesting. So 2 speed was only '36. Russ Huber wrote: Andrew Block wrote: The 4 wingers were short lived from 1938-1939 and seem to have been made concurrently with the thin leaf blades. By 1940 they were elephant ear style. Andrew Block wrote: Interesting. So 2 speed was only '36. 1937- 3 wing 2 speed and single speed. 1938- 3 wing 2 speed and single speed. 1939- 3 wing 2 speed and single speed. I have the a Wagner version. I'd buy another one if I could, these are IMO, the best Emerson circulator. Anyone want the Hunter version? At 200, I don't see any profit and I have enough of the biguns. I paid $40 for one of those a few weeks ago. Too much in that condition. Supposed to see it this week if all goes as planned, He wants 75.00 for it. The blade alone is worth that. Page processed in 0.2234 seconds (16% database + 84% PHP). 46 queries executed.